If you’ve ever found yourself on the road in a dense fog, you know the anxiety of trying to navigate when the cues usually available to you are obscured. It’s easy to get confused. Some days it feels like that’s what has happened with news.  › Amplify intentional distortions or deceptions by creating hundreds of bots disguised as social media profiles. At the same time we rely on accurate information for all sorts of things, grand and small – like the continued existence of democracy, determining where we might want to live, work, or go to school, or even what brand of toothpaste we choose. We rightfully feel some urgency to illuminate our way, concerned that the haze of deceptive news seems to be getting thicker. There are no easy shortcuts. Isolated news literacy strategies are important, but insufficient. It is useful to know how to spot a spoofed news site by looking closely at a URL, identify a bot by looking at its activity history, use a reverse image search, or find backlinks to a website. But these tools help only after people have already identified a story or source as suspicious. And they rely on the longshot expectation that everyone is willing to devote the time and effort needed to use them. Moreover, these tools don’t address structural weaknesses of commercially constructed news – news that isn’t typically intentionally deceptive, but nonetheless is created in ways that lead people to distrust journalists. Despite these challenges, things aren’t hopeless. Zooming out from news literacy to a more comprehensive set of media literacy skills can provide habits of inquiry and skills of expression that instill a sort of internal guidance system. Media literate people develop routines that become automatic, so the brain can’t look at news without asking analysis and reflection questions. The process is much like learning to read print. Once your brain has learned the alphabet’s symbol-sound correlation, and learned that letters strung together form words, your healthy brain can never again look at text like this and not see words. Evne if teh sntense iz wrttten as gibrsh, you can read it because the brain’s default is to make sense of the world. Similarly, media literacy skills can help make sense of a muddled news environment. Media literacy isn’t a foolproof answer, but in terms of getting where you want to go, it can tilt the odds in your favor.  Ask relevant questions and ask them ROUTINELY.  Check multiple sources from diverse perspectives.  Instead of “balance,” look for fair, accurate, inclusive and thorough reporting.  Focus on the evidence, not the “bias” of the reporter.  Look for “independently verified” reports.  Consider your source’s sources.  Don’t confuse sender with source.  Be aware of how media content is influenced by revenue structures.  Accept that you are human.  Don’t believe everything you see.  Pay attention to infographics.  Differentiate between satire sites and deceptive “news” sites.  Make friends with a fact-checking site.  Don’t substitute online tools for your own critical thinking.  Think of yourself as a publisher. ♦ Ask relevant questions and ask them ROUTINELY. Have you ever seen one of those movies where the hero is faced with a choice: There are two seemingly identical people in front of them. One is their partner and the other a doppelganger created by their enemy. Shooting the wrong one means failure and death. How does the hero determine which is genuine? By asking just the right questions, of course! Media literacy is a bit like that. Don’t just question things that seem objectionable or “off” to you; make it a habit to question everything. Even the most trustworthy sources don’t get everything right 100% of the time. Always ask, “Who benefits?” from you believing or disbelieving a story. Get intimate with the Key Categories of media literacy questions. What else would have to be true for what I am reading/viewing to be true? For example, how many people would have to be in on the conspiracy promulgated by Alex Jones (Infowars) that the Sandy Hook Elementary School shooting was a hoax? How likely is it that the number of people with first-hand knowledge of the event would all keep the “secret”? How likely is it that the types of such people would perpetrate a hoax (which, in this case, in addition to journalists, would include clergy, police officers, medical professionals, parents, teachers, children, etc.)? Or ask: What would I have to disbelieve in order to believe that this claim is true? For example, in order to believe that human actions aren’t a major contributor to global warming, you have to disbelieve 80% of the world’s national science academies and a whopping 97% of research papers on climate change published in peer-reviewed science journals. And you’d have to explain how it is that scientists from a range of fields (climatology, geology, oceanography, biology, etc. ), each using different approaches to research and measurement, all get results pointing to human actions. I suppose anything is possible if you stretch reason far enough, but this level of scientific consensus can’t be explained by coincidence or collusion. Dismissing it requires an active effort to live in denial. Sometimes the weight of logic is enough to provide confidence in your conclusion. ♦ Check multiple sources from diverse perspectives. It’s not just about conservative vs. liberal. There are contrasts between commercial and independent media; newspapers, social media, and television; activists, academic experts, and traditional journalists, etc. • Provides a more complete picture of the issues. • Lets you see who is repeating the story and who is ignoring it. Step 1: Invent a story (knowing that anyone who does traditional fact checking will dismiss it as nonsense). Step 2: Complain that mainstream journalists won’t cover the story. Step 3: Claim that mainstream journalists won’t cover the story because they are in the pocket of [insert demon of the day here]; Only the originator of the conspiracy theory is brave enough to resist establishment pressure. Step 4: Use the refusal to cover the story as fodder to grow the original conspiracy theory. Learn to recognize the pattern and be skeptical of any story that is reported/repeated exclusively by overtly partisan sources or individual bloggers. ♦ Instead of “balance,” look for fair, accurate, inclusive and thorough reporting. 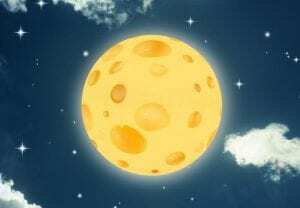 If 300 people believe that the moon is made of cheese and 300 billion disagree, should those two perspectives be presented in a balanced way, especially if there is overwhelming evidence that the 300 cheese mongers are wrong? Reporters committed to “balance” might. They’ve fallen into the trap of “false equivalence” – the logical fallacy that gives equal weight to two sides, even though nearly all available evidence supports only one side. • Apply added skepticism to sources that use the word “debate” to describe something that is actually settled for the vast majority of people (e.g. the “debate” over whether cigarette smoking causes cancer). • Question stories that reduce complex issues to just two sides. This is the opposite of “inclusion.” Rather than seek comment from all relevant perspectives (including minority views which are identified as such), the story stops after it has described just two perspectives. ♦ Focus on the evidence, not the “bias” of the reporter. Labels – assuming they are accurate (and often they are not) – can be helpful in identifying perspective, but they don’t substitute for looking at evidence and its connection to conclusions. Too often we determine credibility by using political, religious, ethnic, or national labels and summarily dismissing everything said by anyone who isn’t part of the group with which we identify. We charge our opponents with being biased while assuming our allies are speaking objective truth. Media literate people don’t waste time trying to determine whether something is biased. We already know the answer to that question: It is. There is bias in all human communication (including news). There is no such thing as objectivity. What media literate people do instead is to ask what the substance, source, and significance of a bias might be. And we look for reporting from responsible journalists from diverse perspectives who acknowledge their biases, follow the evidence with an open mind, verify the evidence they expect us to rely on, and commit to thorough reporting that is fair, accurate, and inclusive. ♦ Look for “independently verified” reports. 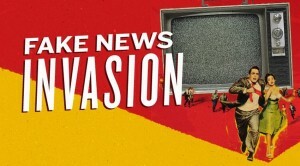 U.S. intelligence sources have recently provided substantial evidence that the Russian government spread fake news by creating an “echo chamber” of hundreds of phony news outlets and social media accounts/bots. To a casual observer who isn’t media literate, it looks like lots of sources are reporting the story, so it must be credible, right? Nope. By itself, repetition doesn’t make a story credible. An unsubstantiated original claim is still misleading, even if it is repeated by a thousand other sources. Instead of relying on numbers, look for sources that say they have “independently verified” another source’s claims. That means their journalists have done their own investigation to confirm someone else’s reporting before sharing it with you. Ready to go even further? You can also use tools like openlinkprofiler.org to see who links to a particular website or who owns it. Sometimes we can judge a source by the company it keeps! ♦ Consider your source’s sources. Who is interviewed or quoted? 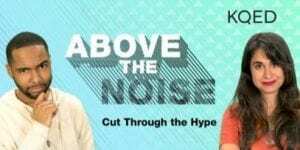 Whose voices are valued? Whose are absent? What qualifies someone as an “expert”? Are the subjects of the story speaking for themselves, or are others speaking for or about them? Using those questions, how would you judge a story about reproductive rights that fails to query any women? How about a piece on air pollution that relies exclusively on fossil fuel industry statistics? Or a story about your neighborhood that quotes city officials but no one who actually lives in the neighborhood? You get the idea. For dessert, the restaurant offers only vanilla or chocolate ice cream. Simple statement of fact, easy for anyone to verify from publicly available information (by going to the restaurant and looking at the menu). The easier something is to verify, the more believable it is, even if you don’t take the time to verify it yourself. According to the restaurant’s owner, the chef wanted to add pie to the dessert menu, but the kitchen didn’t have the oven-space available. Though there isn’t an actual quote, the phrase “according to” means that an interview took place. This is also relatively easy to verify (by asking the owner if it’s what they said), though it doesn’t guarantee that the person being interviewed (i.e., the source) is telling the truth. That’s why good journalists rarely rely on a single source. Other staff members reported overhearing a heated argument between the owner and chef, and that the owner was just too cheap to offer anything except ice cream. It’s a sign of quality journalism that the reporter tried to confirm the owner’s claim. However, salacious details (like “the owner is cheap”) should always elicit extra attention to sourcing. In this case, the sourcing is anonymous. It could be that people really did overhear an argument but weren’t willing to be identified for fear of being fired. On the other hand, anonymous sourcing – especially when it isn’t accompanied by an explanation of why it is anonymous – is always a signal to use caution. In July, twice as many customers selected vanilla as ordered chocolate. This sounds like a simple statement of fact, but if you think about it, it actually requires research over time. It’s not likely that people would argue over the interpretation of the numbers, but it is information that the restaurant must track and also be willing to share. It isn’t the type of information that is available publicly, though you might be able to verify it via a customer survey or vendor delivery records. What’s most likely is that the reporter trusts the restaurant management to supply accurate information. You have to decide whether you think the restaurant has a motive to fudge the numbers. The July results are not surprising given that vanilla is the best ice cream flavor. If a statement tells you how to feel about the facts (it’s “not surprising”) or includes a superlative (like “best”), it’s an opinion. The exception is if a superlative can be independently verified (e.g., today was the coldest day on record). Also, don’t automatically accept expertise in the form of a think tank affiliation, an academic title, or a journal citation. There are lots of for-profit and partisan look-alikes out there. For example, could you distinguish between these? Those that hide the names of reviewers, editorial board members, or funders should give you pause. And then there are the “astroturf” organizations, with names intended to make you think they are something that they are not. For example, the Center for Consumer Freedom implies that it is a consumer group fighting for individual choice, but it’s actually a food industry funded group founded to attack critics. Credentials or affiliations should never be a substitute for evidence or logic. ♦ Don’t confuse sender with source. People who reply “Facebook” when challenged to explain “How do you know?” or “Where did you get that idea?” are confused. Facebook may be where you saw a story, but it is not a source. Neither are Instagram, Google, or Twitter (or any other social network or ISP). These are aggregators of stories from other sources. Similarly, a friend who sends you a story is not the source of that story. Always judge the story itself; don’t judge the story by how well you like your friend. ♦ Be aware of how media content is influenced by revenue structures. All commercial media depend on audience numbers for revenue. The higher the user numbers, the more they can charge advertisers and/or the more data they generate (which they sell). This effects the way that they craft news. Media owners know that our brains thrive on narratives and great stories typically involve conflict, scandal, or danger. We find controversy or calamity more interesting than serious analysis. Don’t you watch more TV or check your news feeds more often when there’s crisis than when things are calm? So we get headlines like “iPads are ruining baby’s brains” instead of clear explanations of the complex and nuanced research about screen time for young children. Controversy sells. Substantive science, not so much. Or, instead of in-depth examinations of candidates’ positions on key issues, we get reports about which candidate is ahead in the polls, because that frames it as a race and competitions are exciting! Or we get non-stop coverage of mass shootings or natural disasters, even when there isn’t any new information to share. Strictly speaking, hyping the dramatic doesn’t make news deceptive, but such coverage makes it seem like the sensational should rightfully be prioritized even when there are substantive stories more deserving of our attention. Media literacy educators call this “agenda-setting.” Media aren’t necessarily telling us what to think, but by devoting their energies to some stories while ignoring others, they’re telling us what to think about. Sometimes profit motives and the public interest intersect, but not every significant story serves commercial interests. So if you rely only on commercial media, you are missing important information. Another handy tidbit to know is that in mainstream news sources, it is standard practice to have headlines written by someone other than the journalist who wrote the story. Sometimes the headline writer is too busy to read the article carefully and just plain gets it wrong. And while headline writers don’t typically intend to mislead, when profits are a priority it is more important for a headline to attract readers than to faithfully reflect an article’s content. So if a headline peaks your interest, it’s essential to actually read the article. Clickbait is another product of profit driven media. It exists because it generates hits, and hits generate revenue. Fortunately, clickbait is usually easy to spot: Headlines that feature superlatives, promise to shock you, or offer infallible solutions to intractable problems are more likely to link to stories that are entertaining than informative (or factual). Also watch out for sites that lure you with provocative pictures that turn out to have nothing to do with the content of the articles they accompany. We also see commercial interests at work in the way search engines operate. Organizations and businesses pay to have their sites appear at the top of the search results (or in a sidebar). That doesn’t make those sites deceptive; it’s just important to know that the list you get is not neutral. Likewise, it is important to know that the search results you get (and the things that appear in your news feeds) are “personalized,” i.e., they are based on data that the platform or service provider has gathered about you from your search history and the things you’ve clicked on. This means that you and a friend could do the same search, or you could do the same search on two different devices, and come up with very different results. The practice of using our past behaviors to provide us with new choices can create what Eli Pariser called a “filter bubble.” The bubble can distort our perception of the world because it suppresses alternative perspectives and creates an environment in which it appears that everyone agrees with what we already believe. Social identity theory suggests that this is likely to heighten societal divisions because it reinforces our tendency to conform our behavior to match those we are with and favor those in our “in group” while attacking those we perceive as outsiders. That gets us back to the importance of pro-actively expanding our environment by seeking information from diverse sources (see the 3rd bullet). ♦ Accept that you are human. • Confirmation bias – the tendency to seek or favor information that “confirms” our existing beliefs. It can undermine critical thinking unless we develop the habit of questioning everything, not just things we find objectionable. • Repetition. Our brains thrive on new input and don’t like wasting capacity to process things that are familiar. So the brain’s response to repetitive messages – even messages we know aren’t accurate – is, “I’ve seen this before. I don’t really have to pay close attention anymore.” We use the term “normalized” to describe the point at which we stop analyzing. Within a day or two, we’ve heard the message of the tweet dozens of times. The message has been “normalized.” We are so desensitized to it that things we once found outrageous don’t disturb us anymore and things we wildly cheered elicit little reaction. And that happens whether the repetition comes from people or sources we trust or from sources we typically dismiss. Propagandists who attempt to create “big lies” rely on this pattern. The remedy? Get your brain in the habit of automatically testing every message for veracity, motive, and consequence. • Familiarity. The more we know about a topic, the better we are at evaluating the veracity of what journalists say about it. The less we know, the more likely we are to believe a news story. Routinely asking basic media literacy questions can, to some degree, offset knowledge deficits. So can studying specific topics in greater depth. The thing is, we learn more than who, what, when, where, and why from news reports. We also internalize a sense of what life is like in places that we’ve never visited or a sense of who people are even though we have never met them. It is important to remember that news, by definition, does not report on the ordinary. It’s always a poor source for a portrait of typical daily life. Don’t rely on news for your conclusions about unfamiliar people or places. Doing so is more likely to lead you to embrace stereotypes than to develop a deeper understanding of life outside your direct purview. ♦ Don’t believe everything you see. When it comes to news, seeing shouldn’t necessarily be believing. Sometimes you’ll encounter a real photo or video, but the caption makes a false claim about what it shows. For example, a few years back there was a video circulating online purporting to show Muslims celebrating terrorist attacks on Paris. It turned out that the video was actually a 2009 clip of Pakistanis celebrating a cricket match victory. Unfortunately, such deceptions are not uncommon. So we remain ever skeptical. If you want to verify before sharing, use a reverse image search to find and check the dates of other posts that include the photo. If your original story is “breaking news,” but there are previous uses of the photo, then you know someone is trying to mislead you. Treat everything posted by that source as if it is radioactive. It’s much harder to identify photos or videos that have been digitally altered, but it is possible. You can submit photos to sites like fotoforensics.com, which differentiates between parts of a picture that were created at the same time and those that were likely added later. Reverse image search results also often include pictures that are similar to the one you are investigating. Sometimes you’ll find an original that makes it clear that your photo has been doctored (e.g., someone has been cropped out). ♦ Pay attention to infographics. Images can leave lasting impressions. People who share misleading graphs and charts rely on that. They distort the image even while presenting accurate numbers. So a quick glance at graphs or charts is never enough to be sure that your takeaway isn’t wrong. Keep an eye out for an axis or bar that doesn’t start at zero (which distorts the relationships between bars and the trajectory of lines). Or look for a graph that’s flipped. Your eye assumes that a line going up represents an increase, but if the graph is upside down, it actually represents a decrease. 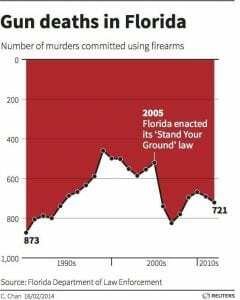 So take a moment to look at what the numbers actually tell you, rather than just a quick glance at the bars or graph lines. It can also be helpful to look for some context for the numbers. For example, an infographic might celebrate that in 2017 (President Trump’s first year in office), there were 2.06 million jobs created. Impressive, right? But there were 2.24 million jobs created the previous year. Now the accomplishment doesn’t seem so extraordinary. Or imagine finding out that someone donated $1,000 to your favorite charity. That’s a sizable contribution, especially if you view it through the prism of your own salary and you earn, say, $50,000 annually. But how would your perception change if you discovered that it came from someone who earns $50,000 a day? It’s handy to know a few basic numbers off the top of your head. One important figure is the nation’s total population. There are approximately 325 million people in the U.S. A petition with 3 million signatures sounds like it is huge, but it would represent less than 1% of people in the country. Context is important. Consider making a list of other numbers worth memorizing. Base the list on the statistics that frequently appear in the news you follow. How about the total number of school-aged children? Or the living wage calculation for your community? Or annual budget numbers? It can also be helpful to memorize a few key dates. Events that reconfigured the world, like World War II (1939-1945) can be important. I often find it helpful to know that Twitter’s very first tweet was sent in 2006, the iPhone was first made available to the public in 2007, and Facebook (which was opened to the general public in 2006) added its first news feeds in 2009. ♦ Differentiate between satire sites and deceptive “news” sites. If you’re in pursuit of facts, don’t rely on any site that intentionally distorts, misleads, or routinely mixes in a kernel of truth to lend credibility to largely fictional stories. That includes satire sites. At the same time, recognize that purpose matters. 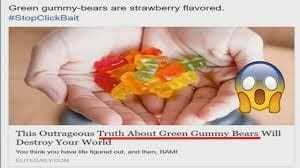 There are legitimate reasons to use and return to sites that post fake content for humor (like The Onion) or education (like the Dihydrogen Monoxide site). Somewhere on these sites, their intentions are always revealed. In contrast, returning to sites that cloak their purposes, or that hide behind the “it was a joke” claim only after they’ve been called out for deception, is likely to increase confusion and line the pockets of people working to undermine the public interest. They often try to mimic credible sites hoping that you won’t be paying close attention. To state the obvious, using a familiar banner font doesn’t make a site credible. There are several lists of such nefarious “knock off” sites. You might consider blocking them. At a minimum, once a source has shared with you something deceptive, beware of everything else they post. One caveat to this: Unintentional errors are not the same thing as deception. Journalists are human and sometimes they get things wrong. Ethical journalists admit their mistakes and print (or offer on-air) corrections. ♦ Make friends with a fact-checking site. No matter how sophisticated your media literacy skills, you will inevitably come across things that leave you wondering. In those cases, it’s helpful to look at how people who verify stories for a living evaluate credibility. I still like Snopes.com because it tackles all sorts of information (including viral emails and urban legends), but there are several others. Factcheck.org and Politifact.com are also useful, especially for quick responses to current news. Still, no site is perfect. Be sure you understand and are comfortable with the methods used by the fact-checking site(s) you choose. ♦ Don’t substitute online tools for your own critical thinking. Some news feed providers have responded to public pressure by providing quick tools to separate legitimate from fake. Twitter adds an icon to accounts that it has verified (i.e., the person is who they say they are). Facebook now tags questionable news stories as “disputed” and gives them lower priority in your news feed. The Washington Post offers a Chrome or Firefox extension that provides context to tweets from the President’s account. Take advantage of all of these tools – and many more, but don’t let them replace your own critical thinking. Commercial and political entities operate in their own self-interest, not yours. ♦ Think of yourself as a publisher. This might be the most important tip of all. Deceptive news stories would have little impact if people didn’t share them. 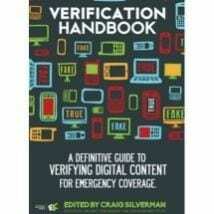 Before you “publish” something by passing it along, verify it. Imagine how different our community conversations would be if we approached fact-checking before sharing as our patriotic duty! If this all seems like an impossible burden, try to remember how it feels when you first use a new action-oriented video game. So many things to pay attention to all at the same time! But as you practice, you get better and it feels like the game gets easier. This will, too. 1 “Brights” (or “high beams”), are a setting that increases the brightness and coverage of a vehicle’s headlights. They are typically used in very dark areas to improve visibility and sight distance. You might assume that they would be similarly effective in fog, but in fact, the light bounces off the moisture in the air and back at the source. 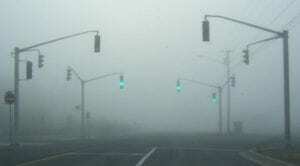 So using your “brights” in fog actually makes visibility worse. There are dozens of great news literacy resources and new ones are being generated all the time. This very short list is created for folks who want to find some basics but don’t have time to search through a full bibliography. In this School Library Journal post, Valenza, an Assistant Professor of Teaching at Rutgers University School of Information and Communication, gathers concepts, vocabulary, and links to resources. A terrific starting place. This “how-to” for journalists covering breaking news, including case studies, provides teachers with a good feel for what people can/should reasonably expect from high quality journalism. Check the treasure trove of kits based on core curriculum areas to find news documents and media literacy strategies for analysis. Key news-related resources are accessible through a single button on the home page. Find local events and national resources connected with this annual national celebration/ observance organized by the National Association for Media Literacy Education (NAMLE). A site created by the Media Education Lab to teach/learn about propaganda. The site can also be used by/with students. 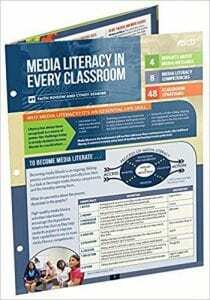 Written by media literacy education veterans Faith Rogow and Cyndy Scheibe, the QRG introduces powerful ways to use media literacy in virtually any K–12 classroom (including 48 activity ideas). This overview addresses recent concerns about the effects of media on democracy, public policy, and culture by outlining an inquiry-based approach that teaches students how to think without telling them what to think. You’ll find more than 50 years of combined media literacy education experience and wisdom condensed into just six pages, including key questions for teachers and students to ask when analyzing and creating media messages. Free, downloadable handout reminds students of the types of questions to ask. Using real-life examples, takes students through issues like what’s included/omitted, word choice, framing, and more. Short videos explore a wide range of hot topics, taking viewers through the process of weighing evidence and making decisions. One of the original fact checking sites, Snopes tells you what parts of the story (or urban legend) are true, which are false, and which can’t be verified. When possible, they also indicate the origin of the myth. Based on the work of Dr. Robert Harris, the CARS framework (credibility, accuracy, reasonableness, support) was designed to analyze websites, and it definitely leaves things out, but it’s a handy shortcut and a good springboard – master it first and then expand to more sophisticated analysis. How to tell fake news from real news? In future history books, one of the notable features of the U.S. presidential election of 2016 will be the rise of white nationalism in the U.S., including the appointment of Steve Bannon – the person who claims to have created the most popular online platform for sharing white nationalist ideas – to a powerful senior position in the Trump White House. To help students understand these events, schools would do well to renew a commitment to teaching about modern history’s most influential white nationalist movement, the Nazis. Nazi history is exceptionally important today because the party’s rise from a white nationalist, anti-Semitic, racist fringe group to a world-class military power that almost succeeded in imposing it’s genocidal dictatorship across the globe remains the primary foundation and inspiration for current white supremacists in Europe and the U.S. It’s not enough to teach that Nazi Germany existed and was our enemy in WWII; we have to help students identify the factors that gave rise to one of the most destructive ideologies in human history. It is fortuitous, if coincidental, that the U.S. Holocaust Memorial Museum is engaged in a project that could help students examine the Nazi rise to power while also engaging in media literacy analysis. 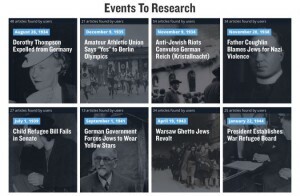 History Unfolded, a crowdsourcing project by the United States Holocaust Memorial Museum, is inviting the public to help crowdsource an answer to questions about what Americans knew about Nazi violence or intentions and when they knew it. Scholars have already examined coverage of events in major newspapers and newsreels, but no one has ever looked at what would have been seen by people who got their news from small town papers in the 1930s and 1940s. So the museum is asking the public to comb through libraries to find local newspaper articles, political cartoons, and letters to the editors. The results will be uploaded to a searchable database and some may be included in the Museum’s 2018 exhibit on America’s response to the Holocaust. Several educat ors and historians involved in the project have pointed out that, in addition to the benefit of students doing real-world investigation, the project provides ample opportunity for students to learn about their own community. What did people in your community know about the event? What do the newspapers tell us about how local and national leaders and community members reacted to news about the event? What did you learn about the relationship between the rise of the Nazis and what was going on in your community? What did you learn about the Nazis or WWII that might be relevant to understanding current events? Where does the story appear (what page) and how much column space was devoted to the topic? What do these factors tell you about the story’s importance to your community? What were the sources of information? Was the reporter on scene or conveying information shared by others? What questions did the reporter ask? What questions might they have asked that they didn’t? Was the information accurate? If not, what do you think accounts for the errors? How was the story framed? What was the primary message? Did the piece rely on or include any stereotypes? What role did AP or other newswire sources play? Did the local paper reprint a wire source or do it’s own reporting? Is there a local angle? 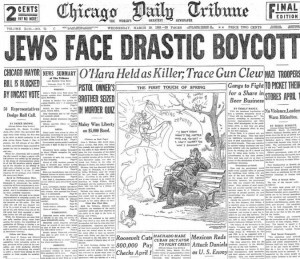 How many news sources were widely available in your community in the 1930s? How did coverage of the Nazis in the source you are looking at compare to other local sources? How did it compare to major national sources? What role do wire services play today? Newspaper editors determined which stories made the front page. Who determines what shows up in the news feeds on Facebook or other social media platforms? How do reporters today gather information? How does the widespread availability of Internet or wifi enabled phones with cameras change the nature or credibility of journalism? How does news coverage influence the way we think about groups of people with whom we may not have much personal contact? How does the existence of “comments” sections at the end of news stories, or links to Twitter threads influence our ideas? How does news coverage influence a nation’s willingness to go to war? When Did Names Lose Their Meaning? I blame it on professional sports. I love it when team names are tied to their city’s identity, like the Pittsburgh Steelers or the Ottawa Senators. But when franchises are sold and moved without changing the team name, fans are often left with oxymoronic appellations like the Los Angeles Lakers (originally the Minnesota Lakers, Minnesota being the “land of a thousand lakes”). L.A. and lakes? Really? Or how about the Utah (nee New Orleans) Jazz? The thing is, we depend on names to convey meaning, and the more they cease to do that, the more alienated we are from our surroundings and communities. To be fair, the problem isn’t just sports teams. Businesses were once reliably named for company founders (think Sears or Nordstrom) or products (General Motors, International Business Machines, or American Tobacco). But in a world dominated by branding, it’s common for company names to be eminently brand-able nonsense words that convey no meaningful information whatsoever. Can you identify what companies like Altria, Syngenta, Xcerra, or Novartis do? Even our civic space has succumbed. Street names once dependably identified residents or location, so River Road was the street that ran alongside the river and Smith Crossing took you over the creek to the Smith family farm. Today, real estate developers (often with no community ties) invent subdivision street names devoid of any real meaning. They attach idyllic-sounding suffixes like “dale,” “wood,” “brook,” or “field” to places that have no valleys, forests, small streams, or open landscapes, geology be damned. 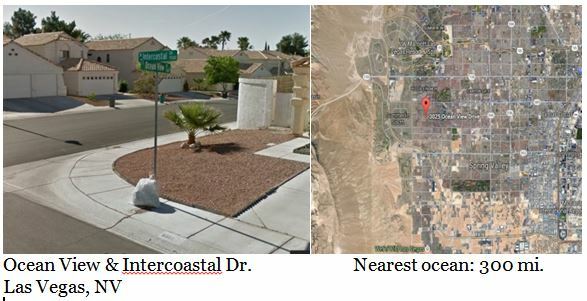 We end up with things like a neighborhood in the desert city of Las Vegas featuring streets designated as Ocean Terrace Way and Ocean Front Drive. It’s branding run amuck. There has always been reason to ask questions about things like street names. If you live in an older city, chances are that most street names honor the lives or interests of the wealthy white men who controlled the city’s development. That should prompt us to ask, “Whose history is omitted?” Such questions produce important insights and occasionally, really fun things, like the New York City subway map with the stops renamed for accomplished local women that is included writer/activist Rebecca Solnit’s atlas of NYC. Now that names are more and more about branding, and more public venues (like stadiums) sell naming rights, asking questions about “authorship,” purposes, and effects is even more important. Next time you roam your community, tune in to the names on the streets, parks, buildings, businesses, schools, and stadiums. Who named them? Why did they choose that name? Do the names reflect anything authentic about your community’s history or character? And what is the effect on the people who live there if they don’t? Arguably one of the most interesting questions is asking whether or not a name is or has been contested? For example, just this month, UNESCO was widely criticized because, in an affront to thousands of years of history, they passed a resolution that seemingly erased all Jewish ties to the religion’s holiest site, Jerusalem’s Temple Mount. How? By intentionally referring to the site using only the Muslim name, Al-Aqṣa Mosque/Al-Ḥaram Al-Sharif. It’s not just a matter of language, e.g., using English versus Arabic. Names are used to either reveal or re-write history, reinforce or challenge cultural hegemony. Consider, for example, ongoing disputes over the way the U.S. Park Service identifies a popular Wyoming national monument. Maps and signs currently use “Devils Tower,” even though that name is widely recognized as a mistake made by a U.S. Army colonel in 1875 when his interpreter mistranslated what locals were saying. Attempts by the Sioux and other tribes to correct the error and communicate their sacred relationship to the striking rock formation have faced considerable resistance by local political leaders. Efforts to officially change the name to “Bear Lodge” have failed. The public explanation for rejecting the request is that officials don’t want to waste the time and money spent on a marketing campaign designed to attract tourists to Devils Tower. So branding trumps an opportunity for accuracy, and perhaps a modicum of reconciliation. Hmmm. Media typically render naming disputes invisible. My own town – Ithaca, NY – is a case in point. In 2006, in response to an initiative by people pursuing social and racial justice, the city voted to add Martin Luther King, Jr. Street as second name to State Street. Yet, Google maps still labels the thoroughfare only as State Street. This is not an entirely outrageous choice. The road has been called State Street for more than a century, and out of habit, many locals still use only that designation. But the result of the choice is that newcomers would never know there is a street in Ithaca named after MLK. When journalists cover stories involving disputed names, they face even more difficult choices about which terms to use. Should they stick with the status quo? Use multiple names even if it means unwieldy prose? Use a newer name even if it may not yet be in common use? More importantly, once writers have made their choice, do they ever acknowledge that they’ve chosen a side, or do they leave readers/listeners/viewers inadvertently ill-informed because the absence of explanation conveys the false impression that there is no controversy? I wonder what would happen if (at least in online sources) reporters helped the public tune in by hyperlinking disputed names to background on the controversy and the criteria they used to choose terms? No matter what journalists choose to do, we can tune in to news coverage of communities or conflicts by asking, What role do names play and what do they tell us about purpose, identity, and power? Which names do journalists use and what do their choices tell us about their perspectives and policies? Because, as it turns out, in spite of pervasive branding, names still do have meaning.